High School of the Dead Blu-ray Review. Some great storytelling opportunities go begging, in favour of a whole lot of swearing and ditsy fan-service antics. There’s no getting past it- Zombies are big. You can find them everywhere these days, from cinema to literature to comics and games. Did any of us think that manga and anime were safe havens from these pop-culture staples? Well if you did, you were wrong. Dead wrong. 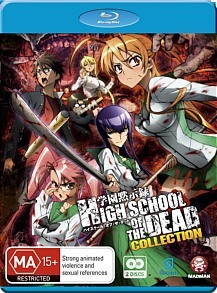 ‘High school of the Dead’ is a twelve-part series, based on the manga by Daisuke Sato and Shouji Sato. It takes us through the (By now) all too familiar undead outbreak, from its early stages to its inexorable spread across the globe, to the desperate last stands of tiny pockets of survivors. High school students Takashi and Rei are at the forefront of the disaster, as the outbreak spreads through their school and then right across Japan. They fight their way through the school gates, joined by repressed gun-maniac nerd Kohta and voluptuous school nurse Marikawa. Each of the twelve episodes has a vaguely Romero-sounding title, and takes our protagonists through a new set of challenges- such as the first escape from the school, to the search for food and weapons. The titular ‘dead’ antagonists follow most of the western traditions of zombie stories, with one small diversion: they can’t actually see, and are only able to hunt and feed based on their hearing. I can’t go any further with this review without mentioning the (extremely) over the top ‘fan service.’ While it does have plenty of zombie-slaying action, HOTD is basically a 300-minute excuse for some cleavage and up skirt action. No opportunity is wasted to show a pair of jiggling breasts or a flash of underpants. The female characters are determined to put themselves in the most exposing situations possible, by bending over a balcony or leaning forward to show off their assets. Every time the vehicle they are riding in goes over the slightest bump, we get a close-up of jiggling cleavage. Nurse Marikawa is so comically well-endowed that she actually comes with her own ‘ka-boing’ sound effects- if it’s a well-thought out essay on the human condition in times of stress that you’re after, you’re going to have to get it elsewhere. For anyone over fourteen (mentally and physically) it’s a bit of a shame that so much time and effort has gone into this comic relief and not so much work has been done on character development and depth. I’m as much a fan of a set of perfectly animated breasts as the next man, but I also like a good story, with characters I can engage with. Some of the characters show glimpses of conflict and inner trauma, but the emotional impact is almost always ruined by another ridiculous moment of fan service. When the action does start up, it’s usually with a punch. The fighting scenes are dramatic, energetic and sometimes surreal, and for me they’re the highlight of the series. High school of the dead features traditional hand-drawn animation, as well as a smattering of CGI effects for the vehicles and action scenes. The palette is very bright, with pronounced colours and lush backdrops. It makes for a very attractive visual package on Blu-ray. Included on the disc are textless opening and closing credits and a few trailers, not too much to get excited about. Some great storytelling opportunities go begging, in favour of a whole lot of swearing and ditsy fan-service antics. The zombie-slaying action isn’t enough to carry it through- this one is hard to recommend.